The Makarbas is the room on the ground floor, originally one of the 2 principal salons, it leads onto the courtyard and can be a double or a twin room, (€110 including breakfast & all taxes) Book direct with Robert and Fatima for price matching and local knowledge. The Shoowaf is the room on the middle floor, originally the head of the household’s quarters. 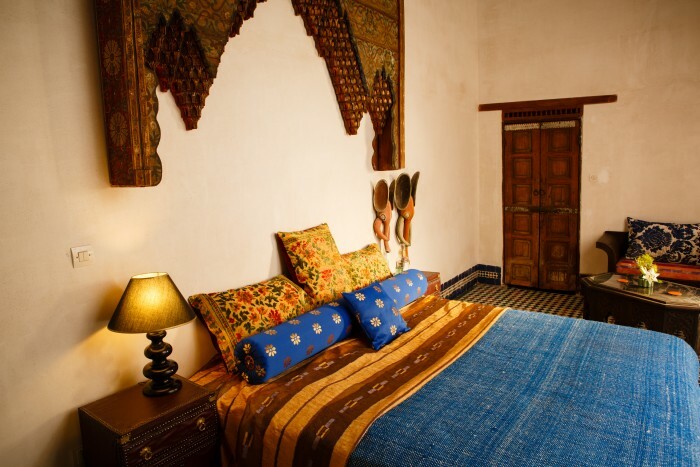 It has an ornate painted ceiling & a window onto a quiet street as well as internal windows and is a double suite (€135 including breakfast & all taxes) Book direct with Robert and Fatima for price matching and local knowledge. The Library is the room at the back of the house, that leads off the library on the middle floor, It has a 4 poster bed & windows onto the internal courtyard. It can be a double or a twin room, (€135 including breakfast & all taxes) Book direct with Robert and Fatima for price matching and local knowledge. 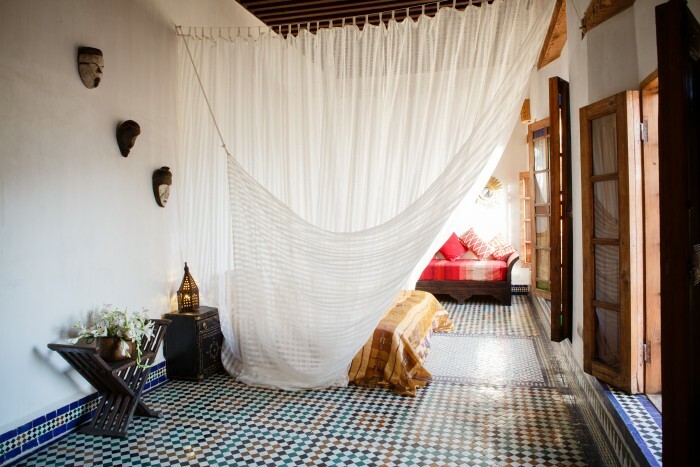 Mensah is the largest room in the house, on the roof and looking out onto the terrace & the the medina and hills beyond. It was built later than the rest of the house and is simpler in design, It can be a double, twin, triple or a quadruple family room, (depending occupancy €145 to €160 including breakfast & all taxes) Book direct with Robert and Fatima for price matching and local knowledge. 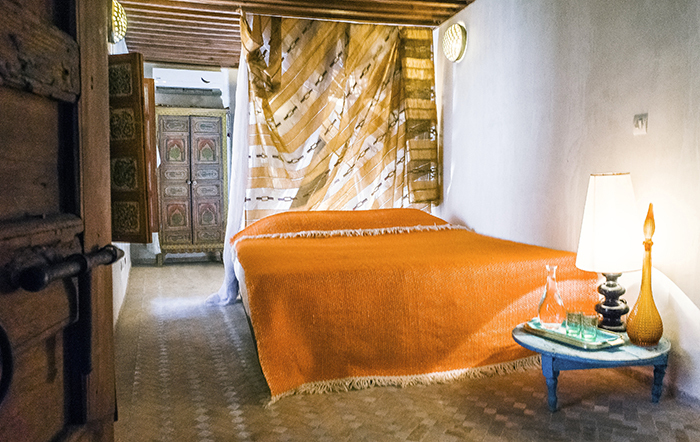 The Mezzanine is small & perfectly formed, It can be a double or a single room (€90 including breakfast & all taxes) Book direct with Robert and Fatima for price matching and local knowledge. The bathrooms are furnished with rain showers, mist-free mirrors, heated towel rails, hairdryers & bathroom products. 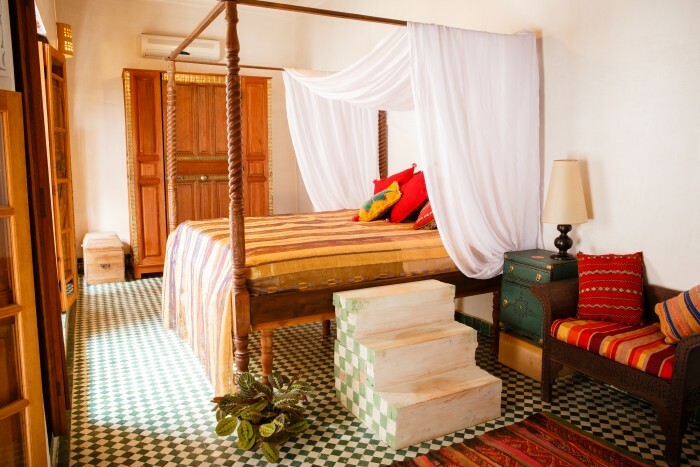 The rooms have reversible air-conditioning, a personal safe-deposit box as well as kaftans & slippers, flowers from the garden and wifi. Mineral water is complementary though if you prefer we can provide decanters of tap water. 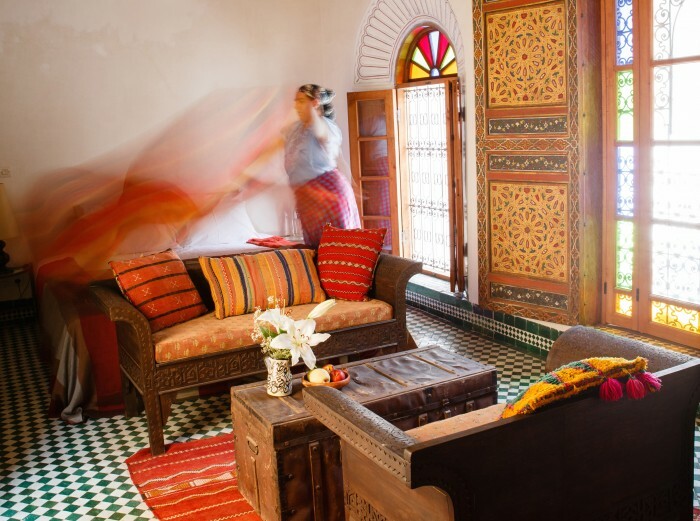 To preserve the feeling of traditional medina life there are no televisions in the house, we have informal room service, and we can also serve you on the Evita Balcony or in the garden. There are seating areas in each room as well as in the library, on the terraces & in the centre of the house. You can learn to cook 5 moroccan breads or you take a vegetarian cooking class in the garden, mail us or speak to us on arrival. We can work around food allergies and preferences.